First we want to say that there are no rules about how much you should spend; on a diamond, on wedding bands or on your wedding. This is not about "keeping up with the Joneses". We all have different priorities and different responsibilities. This is just some information that we found interesting that we wished to share with you. The amount that bridal couples spent on their (and occasionally colored gemstone) engagement rings surged almost 56% in 2018, according to Brides' American Wedding Study. The surprising climb; from $5,023 in 2017 to $7,829 in 2018; may reflect a demand for more ornate setting styles and larger center stones. 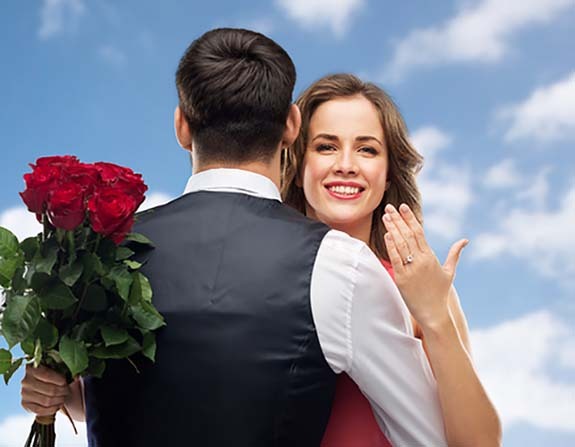 The diamond engagement ring stats were part of a broad based survey that also revealed the cost of an average wedding zoomed to an all time high of $44,105, as more and more couples sought new ways to personalize and extend their celebrations. • 7% have a live feed of wedding hashtag displayed at the reception (i.e. Instagram photos, tweets, etc. ).